A picture of a giant megalodon shark created a stir on the internet. It was between 60 and 80 ft. long, laid out as plain as day on a platform for all to observe, it’s massive, dagger-like teeth, gleaming in the sun. This wasn’t merely a huge great white. It was clearly something else. Something much, much bigger. A balloon shark was created for a fake documentary, asking the question; “Does this giant prehistoric shark still swim the oceans of the world?” The shark was a prop for a heavily advertised program on The Discovery Channel’s ever-popular “Shark Week,” which has been running annually for nearly 30 years. Millions saw the show. 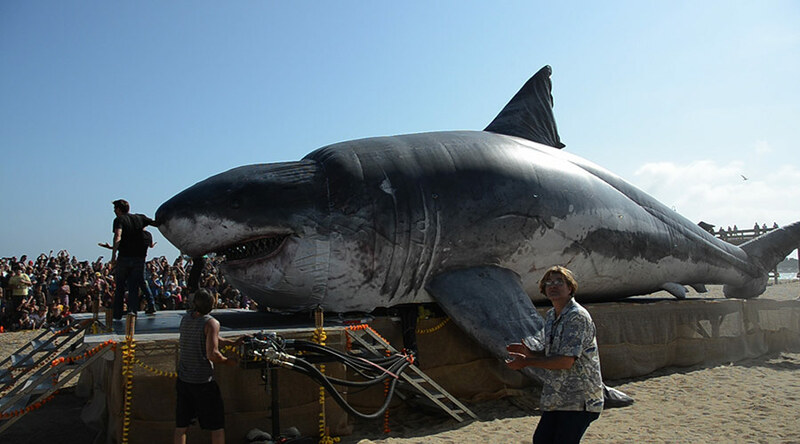 Regardless, an image of the mock-up giant shark became a cryptozoological sensation. Even after the show aired, many still believed it to be a living relic of the prehistoric past. All, thanks to the power of the internet. “Here is evidence that the mammoth megalodon still lives!” would-be Cryptozoologists proclaimed. Who could deny it? The evidence appeared to be staring them dead in the face. What did it take to debunk the great balloon-shark mystery? A few minutes, maybe even a few seconds of research. That’s it. Still, the blimpish megalodon gets plenty of hits. And still, people believe because giants sharks are cool. And, most importantly, because they want to believe. A similar incident happened about two years ago when Bernie Sanders was still in the thick of the presidential race. A well-known rapper named Killer Mike made a video of Sanders, comprised of clips of Bernie getting arrested during the civil rights era, walking with Martin Luther King, and giving a rousing speech wherein two young Black women took the stage at a Sander’s, political rally. Killer Mike offered the clip as an example of how much Sander’s cares about poor Black folk. So much so that he’d given two, young, unknown women of colour, a platform to speak, while he attentively listened. The only thing missing from the clip was sound and some hint of continuity between the heavily edited images and video. The clip consciously left the sound out of the original video for good reason, otherwise, you’d hear these sweet Black angels yelling about racist White Motherf*ckers, as they excoriated the crowd with a barrage racial insults like an acid-dosed, Ella Fitzgerald, scatting the blues. These same race-minded harpies angrily commandeered the microphone from Sanders, who sheepishly handed over the stage and began cowering in the background, just like one might expect from a great world leader. In other words, like the balloon shark, there wasn’t a hint of reality in Killer Mike’s presentation. But it was damned fine propaganda. In spite of the fact that the complete, unedited video was readily available, and had already been seen by millions of people in its original form. Just not the millions who determined that it was proof that Sanders cares deeply about the plight of two, sweet young Black girls. This is hardly rare. A recent photo of an emaciated Polar Bear was offered by National Geographic as de-facto proof that global warming is real. This was followed by an endless barrage of rabid comments about how humans were a pestilence. And, how anyone who doubted global warming, was unrepentant scum, worthy of death. Within a day or so, however, an expert debunked the story, stating that most likely the Polar Bear had cancer—and, furthermore, Polar Bears aren’t endangered. How about the famous photograph of the lone Polar Bear swimming in an endless sea, searching vainly for an ice flow, with none in sight. Apparently, there are no more ice flows left because of global warming, leaving the bear to drown from exhaustion. There was just one problem, the person who took the picture said the bear seemed in no danger. Polar Bears are very good swimmers. Plus, there was ice, everywhere, it was just outside the camera’s frame and couldn’t be seen in the picture. Even so, for many, this image became proof of dying Polar Bears, who were a symbol of a dying planet. This compelled politicians around the world to decry the hubris of mankind. Which, in turn, led to a demand for legislation to save the rapidly vanishing Polar Bear. American politicians, not surprisingly, were only too happy to oblige. How about the most recent political bombshell, proving collusion between Russia and Trump, from about ten days ago. The media leapt on an email sent to Trump’s people, which urged them to contact the Russians. So they could get the inside dirt on Hillary and the DNC. “There it is! Proof of collusion!” said the Left’s new, favorite adulterous couple, Joe and Micha, of Morning Joe fame. Then came the harridans on the view, followed by CNN, MSNBC, The New York Times, and The Washington Post. Even, ABC’s longtime media stalwart Brian Ross got in on the action. Predictably, every last one of them, attacked the story like a pack of starving hyenas on the African savannah, in the middle of a drought. Following the Brian Ross-ABC-hit-job, which got him suspended, the stock market took a nose dive. This too, was a cause for celebration, since it would undermine a burgeoning economy, which favored Trump. Better we all drowned, than give Trump a crumb of credit, I guess. But, like clockwork, the story fell apart as someone finally looked at the date on the email, showing that it was sent two weeks after the election. Meaning, it was proof of nothing that wasn’t already well-known, by pretty-much, the whole damned world. You’d think that checking the dates would’ve been a relatively low standard to meet when declaring that the president of United States was in cahoots with the Russians. But cahoots are always big news—meaning big advertising revenues—as Hillary’s dimwitted minions in the press and beyond wait anxiously for any sign of cahoots, even the made-up ones. In other words, context is everything, whether we’re dealing with dying Polar Bears, giant balloon sharks, or evidence of Russian collusion. People believe because they wish to believe—and, for very personal reasons, no doubt. A lie is still a lie, though, no matter our motives. Our inner motives are simply the fuel that lights the fire.